Explore a magical arts trail around Ashford. Celebrate Ashford’s best bits to support local hospice care. The magical Snowdogs Discover Ashford arts trail is running 12 September - 18 November 2018. Giant, individually designed and beautifully decorated Snowdog sculptures are placed around Ashford to create a world-class sculpture trail that encourages everyone to discover the town. Our work is as much about supporting people with incurable illness to live as it is about caring for them at end of life. The Snowdogs trail will be a wonderful celebration of Ashford life, so we are really pleased to be involved. The trail features 35 Snowdog sculptures designed by local artists and sponsored by local businesses, together with 19 Snowpups that have been designed and decorated by 19 local schools. 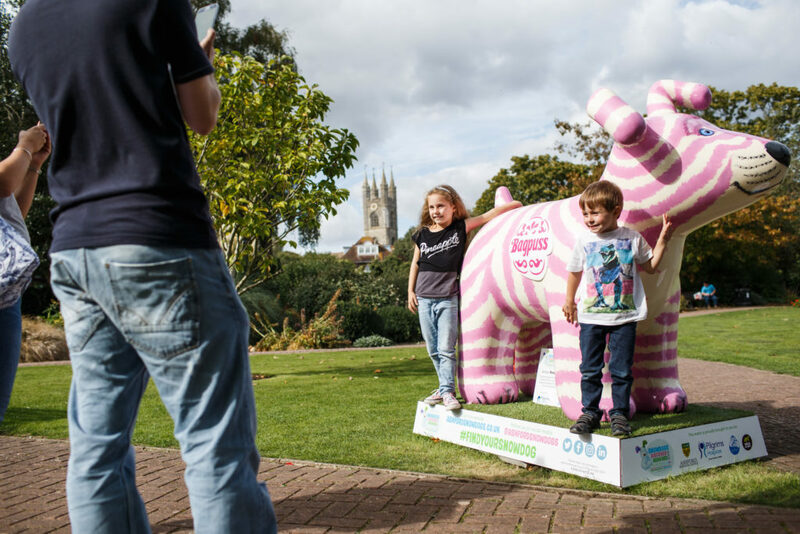 Pilgrims Hospices’ Snowdog is called Bagdogg; he is inspired by the popular British children’s television series Bagpuss, created by Peter Firmin and Oliver Postgate, founders of Smallfilms. Bagdogg was co-created by Peter and his daughter, Emily Firmin. Emily continued painting the Snowdog after her father’s death earlier this year; Pilgrims nurses and expert medical staff helped care for Peter in his last days. Bagdogg has been placed in Memorial Gardens in Ashford, in loving memory of Peter Firmin, 11 December 1928 – 1 July 2018.
Who is your favourite – Doodle Dog, Harvey Hound, Pawberry or Pilgrims’ Bagdogg? The trail also raises awareness about the services Pilgrims offers for local people coping with incurable illness, and their families and friends. On Saturday 1 and Sunday 2 December, join us at the Julie Rose Stadium to see all the Snowdogs and Snowpups together before they run off to be auctioned to find their ‘furever’ homes. This is your only chance to see all the Snowdogs and Snowpups together; 55 sculptures in total (plus a few Snowdog surprises) all in one iconic Ashford venue. Visit the pack out on the track! Wrap up warm and catch the film The Snowman and the Snowdog on a big screen throughout the weekend. A children’s bouncy castle and activities will also be available, included in your ticket price. On Monday 3 December, we're inviting auction-lovers to bid for the beautifully crafted and individually designed Snowdogs in aid of Pilgrims Hospices, so that we’re able to be there for the next family that needs us. The Gala Auction will be a glamourous evening of fine wine, entertainment and bidding, where the beautiful pieces of art will be auctioned off to their ‘furever’ homes. Get ready to raise your paddles and generate the buzz at Ashford International Hotel, as our celebrity auctioneers lead you through a thrilling night of entertainment and bidding. Tickets are £30 per person. You can also bid live online against our guests in the room. Please click here to visit our Snowdogs online bidding platform, provided by our auctioneer Michael Hogben of Westhanger Auctioneers who will be hosting our Gala Auction. You can bid online with the Sales Room by registering, adding your details and watching the lots. You can enter your maximum bid now and this will be taken into the auction process on the night along with all bids in the room and other absentee or commission bids received. We encourage you to read the Sale Room Westhanger Auctioneers Terms and Conditions regarding online bidding and also the Snowdogs Conditions of Business and Guide for Bidders. To register as an online bidder, please email fundraising@pilgrimshospices.org. All auction attendees and bidders must be over 18. You must be registered to bid, in advance of the auction, by completing a Registration Form, which will be emailed to you. Bidders from further afield than east Kent, UK will need to pay for delivery and the charity will liaise with you regarding delivery dates. If you have any questions regarding online bidding please email fundraising@pilgrimshospices.org. Download, print and fold the trail map, with lots of information to help you enjoy visiting Ashford and finding new locations in the town you love. Grab the map, download the trail app and discover the whole pack of Snowdogs! 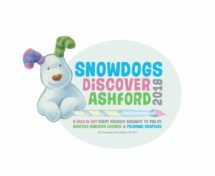 Read more about Snowdogs Discover Ashford 2018 and keep an eye on this page to find out about future events. Follow the Snowdogs online via Facebook, Twitter, Instagram, LinkedIn and at ashfordsnowdogs.co.uk. This year’s Ashford town centre festive fun day will be in celebration of all things Snowdogs; paws for thought and join in the fun! See all the Snowdogs and Snowpups together in one place before they run off to be auctioned to find their ‘furever’ homes! 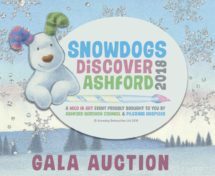 Come and see the Snowdogs find their ‘furever’ homes as they’re auctioned for Pilgrims and Snowdogs Discover Ashford 2018 draws to a close.